Today we are showing off a render of yet another vehicle that you may have seen in our Dev Stream of Pegasus Bridge. It is of course the Renault UE Chenillette. During the 1920's the French Infantry had decided to fully mechanise their formations, however there was not enough money in the budget to fully achieve this. One things that was decided upon was the need for a small armoured vehicle capable of carrying supplies to units under fire. A number of designs were submitted, and the submission from Renault was chosen in October 1931. Loosely based on the Carden-Loyd Mark VI, the Renault UE was capable of carrying 350 kg of supplies in its rear basket, with a further 600 kg in the UK trailer. The basket could be tilted to more easily remove supplies. The vehicle was so low that armoured hoods had to be placed on top of the crew compartment to protect their heads. Communication between the commander and the driver was accomplished with a set of coloured lights. Following the fall of France, the Germans captured about 3000 Renault UE and used many of them unmodified as tractors for smaller artillery pieces. Amongst other modifications, about 40 were modified to carry 4 Wurfrahmen 40 rockets. 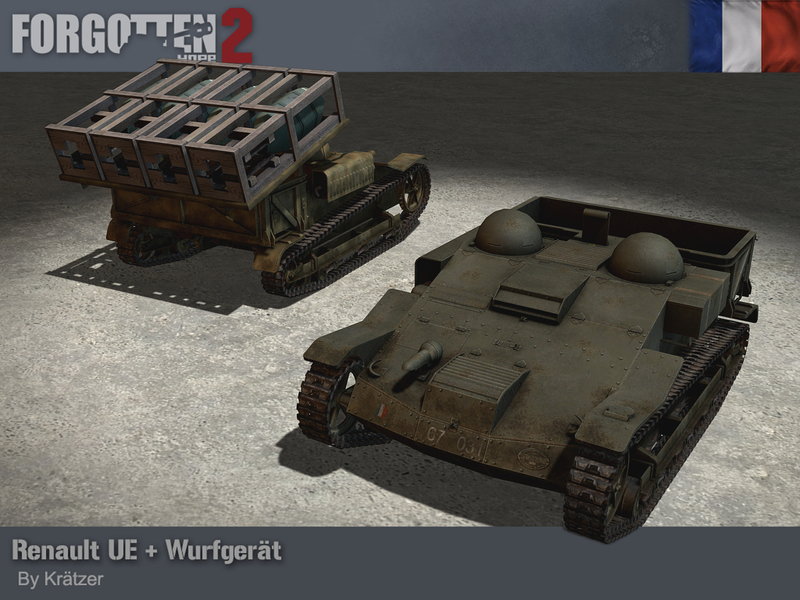 These were known as Selbstfahrlafette für 28/32 cm Wurfrahmen auf Infanterie-Schlepper UE(f). The frames that held the rockets were either mounted to the sides or on a platform fixed to the basket. Our Renault UE was made by Krätzer. Today we are showing off some playermodels. 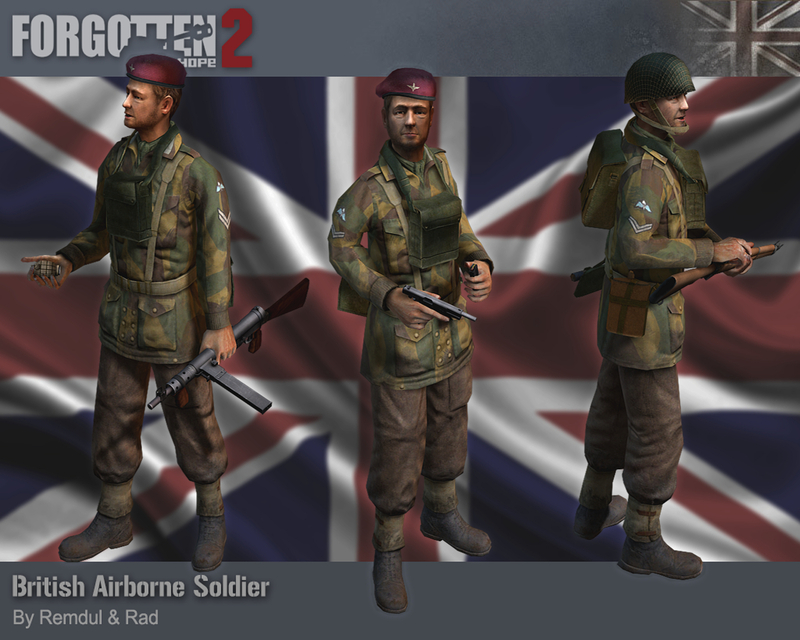 Eagle eyed viewers may have seen them already in our recent Dev Stream of Pegasus Bridge, but for those of you who missed it, they are of course the British Airborne. The first British airborne units were formed in 1940 at the request of Churchill, who was impressed by the success of German airborne operations in the Battle of France. The 1st Airborne Division was formed in 1941 and followed by the 6th in 1943. While the 1st Division fought in Italy and at Arhnem, it was the 6th Division that would land behind the beachheads on D-Day. Perhaps the most visible difference between the airborne and the normal infantry was the Denison smock. This camouflaged jacket was intended to be worn over a parachutist's equipment to stop it snagging. Our Airborne models were modified from Rad's original African models by Remdul. Our winners for this week's screenshot competition is Roughbeak. You can view the winning submission here. We are now accepting entries for the week of May 25th. If you think you have the best FH2 screenshot, post them here.